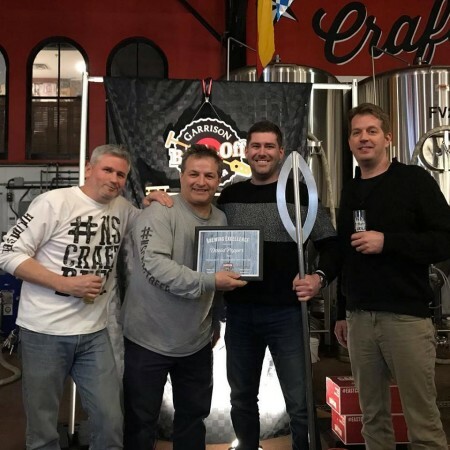 HALIFAX, NS – During an event held last Thursday February 28th at Garrison Brewery, the winner of 2019 edition of the Garrison Home Brew-Off was announced, and a commercially brewed edition of the 2018 winner was served for the first time. The winning beer in this year’s competition, which challenged homebrewers to create a Dunkles Bock, was brewed by David Pepper. Runners-up included Scott MacLean (2nd place), Jeremy Slaunwhite (3rd place), and Kevin Sweezey (honourable mention). As is the custom at this annual event, the evening also featured the release of a full-scale batch of last year’s winning beer. 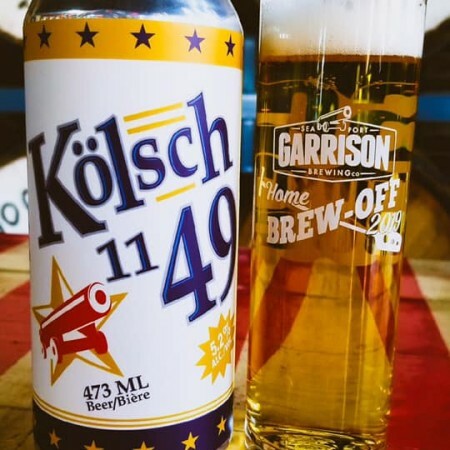 2018 winners Dave Martin & Kent Brooks worked with Garrison brewmaster Daniel Girard to scale up their recipe for Kölsch 1149 (5.2% abv, 25 IBU), and it’s available now in 473 ml cans at the Garrison retail store. The style for the next edition of the Home Brew-Off has been revealed to be New England IPA, and full competition details are expected to be announced in the autumn, with the awards ceremony and commercial release of David Pepper’s Dunkles Bock to follow in early 2020.